This month started with a gig (Not My Tempo) playing at the NorthWest Brewing Company. It was the second time out using the UI16 Soundcraft wireless mixer and as such I was a bit nervous about technical problems that might occur - so I couldn’t believe it that after setting everything up (mixer and PA-wise, that when I played the first note of the first song at 8:00pm I was getting this terrible scratching sound from MY AMP (not the PA),!! !….followed by the sound dropping in and out. My initial thought was there was something wrong with one of the leads, so I started by making sure everything was plugged in properly, followed by an attempt to replace some of the leads…..all while I am trying to play!!!! With no joy I then switched to my spare bass head after the first song…and guess what….still no joy…..so that had me thinking that it was either the speaker or the bass….my feeling was that it wasn’t the speaker due to the fact that for some moments everything was fine….so what to do?…….After a couple of songs, things seemed to settle down a bit and I managed to play through the rest of the set with crackles and drop-outs. 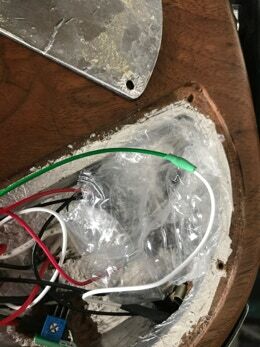 In the break I pulled the back off the battery hatch (knowing I had just changed it) on my bass and then the control compartment……viola!….a resistor had come loose. 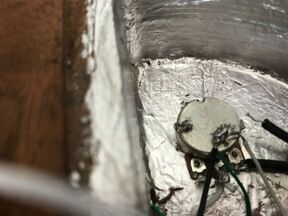 Not having time or a soldering iron available, I managed to rescue a piece of gaffer tape and using some bubble wrap, force-pressed the loose wire back where it was supposed to go using the control panel back plate as the mechanism to force the bubble wrap down on the resistor pin. We played another gig at Rock The Dock in Tacoma for the festival of sail (Only in America can you see the Worlds Largest Rubber Ducky!!!) - and from a bass perspective it was a much smoother event! No technical problems. Additionally the band (Not My Tempo) is starting to really come together with our new players. (myself, LA, Roger, Nick and Chris). As well as the band stuff, I also have a new wireless belt pack (nice !!! XDR1) and a Boss ME20B multi-effects unit that I received for Fathers day. Im still figuring it out but I like the octaver for ‘Play That Funky Music’ and the Flanger for the runs in ‘Listen To The Music’. Im also expanding the website to cater for more video segments in the lessons section for students. I have had positive feedback in this area so are continuing to create short lesson videos. They may not be perfect but hopefully they are useful as reminders to students around what we covered in lessons….